This morning, I experienced one of the cats’ more unpleasant methods for waking me up. It involved claws. In my scalp. Once I had finished swearing, we got our act together and we had a day out in Newcastle. At Not-So-Small Son’s request, we took a trip up to the Centre for Life to check out the Wallace and Gromit ‘Cracking Inventions’ exhibition which was actually pretty cute. There were lots of displays on various inventions and also my favourite; exhibits of the Wallace and Gromit sets and models. 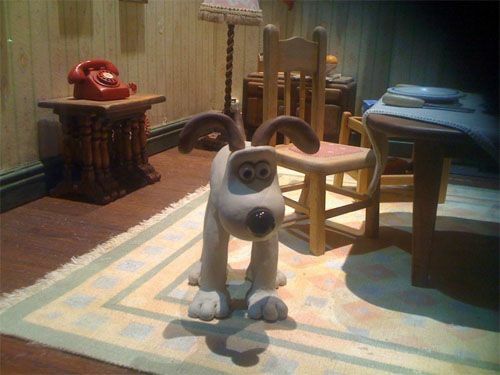 I have great love for Nick Park’s little stroke of comedy genius and a very soft spot in my heart for Gromit. There are so few animated characters who can convey such emotion with nothing more than a slight furrowing of the brow. I named this piece 'A Still Life Study of Friday Night in the Bigg Market'. Not QUITE enough vomit, though. Seriously, we played with that stuff for ages. Not-so-Small-Anymore Son made an Easter Island head statue. I made a cat. Dearly Beloved made the above, and a comic octopus. Curse his talent with pliant modelling stuffs. Then we moved on to build a marble run, where without my inner civil engineer suggesting solutions to over-shoot problems, the marbles would have all vanished somewhere. My masking tape wall was particularly effective. I have Macguyver DNA somewhere in my genetic makeup, possibly. I love interactive exhibits in museums. 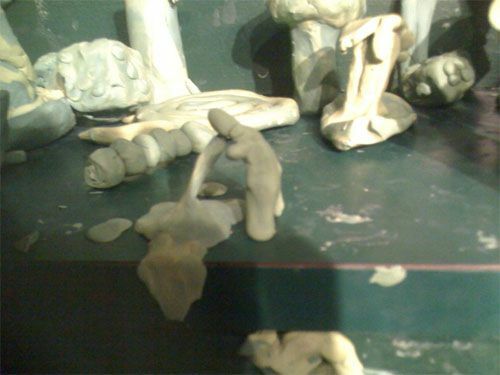 I have fond memories of going to the Science Museum in London when I was a kid. There’s just something compelling about pulling levels, pressing buttons and sitting in front of a blue screen to read the weather forecast from the world’s slowest auto cue. (The weather conditions to choose from were ‘Ice Age’, ‘Storm’, ‘Heat Wave’ and ‘Flooding’. Cheery, huh? I suspect there was a message about Global Warming hidden somewhere in the exhibit, but we wanted to read the weather from an auto cue). There was also a ‘Karaoke Shower Booth’ where you could sing along in what was made up to look like a shower. Without the water. But it was a good laugh. Not-So-Small Son sang ‘Livin’ on a Prayer’ by Bon Jovi exactly a semi-tone out of tune the entire time. Dearly Beloved drew a detailed blueprint for a mecha-spyder on a whiteboard, then some bloke just sauntered up and rubbed it off. Moments later, he replaced the pretty amazing drawing with… a cloud. Then he walked away. We may have erased it. We’re SUCH grown-ups. We rounded off the day with the expected trips to Forbidden Planet, Travelling Man (where I got X-Men Schism 1, 2 and 3), Games Workshop and then trundled off to have an early tea. Then we squashed onto the train and came home. It wasn’t exactly an action-packed day out, but you know what? It was a bloody good laugh. It made a pleasant change to spend time with my family and not worry about cancer waiting times breaches, or my word count (although I did come home and finish the first edit of Project: Lonestar. It’s been lovely to spread my Space Marine wings again). This entry was posted in General, Writing and tagged Black Library, blather, Family, life, Writing.